LYDON, MARY A. 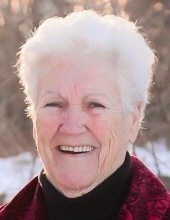 (McMenamin) of NH formerly of Roslindale passed away on November 28, 2018 at the age of 80. Beloved wife of the late Joseph Lydon. Devoted mother of Anne Marie Clancy and her husband Brian of Franklin, Patrick J. Lydon of FL, Thomas E. Lydon of Spencer, Maureen Bannon and her husband Michael of NH, Joseph J. Lydon and his wife Tammy of PA, Brian W. Lydon of Plainville and the late Michael C. Lydon. Sister of Patrick McMenamin of Ireland and Ann Walsh of England. Cherished grandmother of 12 grandchildren and 6 great grandchildren. Also survived by many nieces and nephews. Daughter of the late Thomas and Sarah (McLaughlin) McMenamin. Funeral from the Kraw-Kornack Funeral Home 1248 Washington St. Norwood Monday, Dec. 3, 2018 at 8:45am followed by a funeral mass at 10am in St. Theresa of Avila Parish 2078 Centre St. W. Roxbury, MA. Visiting hours will be held on Sunday, Dec. 2, 2018 from 2-6pm. Burial will be at St. Joseph Cemetery W. Roxbury, MA. To plant a tree in memory of Mary A. (McMenamin) Lydon, please visit our Tribute Store. "Email Address" would like to share the life celebration of Mary A. (McMenamin) Lydon. Click on the "link" to go to share a favorite memory or leave a condolence message for the family.